Number of cards in deck: 80, divided into 72 "minors" & 8 "majors"
Back of card: Blue tones, based on card 72, Mumaiah. May be inverted. Book included: Yes, 190 pages, 5.9 x 8.3 inches, or 15 x 21 cm. Illustrated, in English only. 73 - 79: The seven planetary Archangels: Michael, Gabriel, Raphael, Anael, Ariel, Zachariel, Cassiel: Solid yellow background. For the illustration above, I chose the first angel in the first series, the second in the second, the third in the third (etc), up to the Virtues, where I ran out of space. The last card in the regular series, number 72, was chosen as it is also used on the back of the cards. In each eight-card formation (1 - 72), there is an Angel for each of the eight planetary deities, eg, Uranus, Saturn, Jupiter, Mars, Sun, Venus, Mercury & Moon. Neptunian angels are omitted. (Also omitted: A range of angels corresponding to Pluto.) As you can see above, Uranus angels have violet robes, Saturn angels are green, Jupiter's are blue, etc. So there is an angel for every possible planetary pairing, of Sun through Uranus. Each card is illustrated & described in the book. Each description includes: Keyword, Areas concerned, Gifts & Divinatory significance, Relevant time period. There follows Guided interpretation definitions, and specific question definitions. Guided interpretation relates to a seven card spread, each representing one of the seven Planetary Archangels (as listed above). 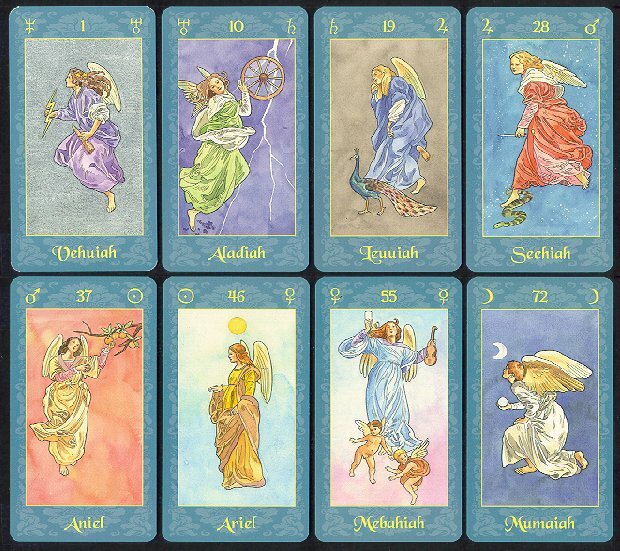 Under the Guided Interpretation, each of the 80 cards are defined in each of the seven positions. The specific question relates to a three-card spread. Definitions here relate to each of the three possible positions each card can have. A lot of work went into these two sections. The Relevant Time Period relates the angels back to the calendar. Seventy-two divides into 365 five times, with five left over. Starting with Angel no. 1 & March 21st, each of the first 72 angels are given five days of the year. The book does not say what happens to the extra five days. I presume they added an extra day to each of five lucky angels (I did not look at the book closely enough to find out). Each angel also relates to one or two days of the week, as derived from the planets shown on it. All the Seraphs & Cherubs relate to the Sunday, plus the day ruled by whatever other planet is paired with the specific angel card. Thrones/Saturn relate to Saturday, Dominions/Jupiter to Thursday, Powers/Mars to Tuesday, Principalities/Sun to Sundays, Virtues/Venus to Friday, Archangels/Mercury to Wednesdays, Angels/Moon to Mondays. This is derived from standard astrological rulerships. The Relevant Time Periods for cards 73 - 79 (Planetary Archangels) are a day of the week, and a month. The time for the final card, Angelic Palace, is immediacy. The underlying concepts about angels stem, of course, from the Catholic Church, though they did not invent angels (not that they ever could be invented). The Catholic connection goes unmentioned in the book. All-in-all, an impressive deck & book set.